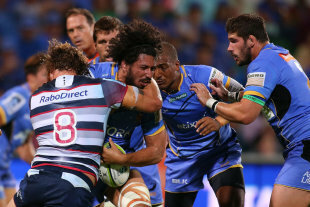 The Rebels have managed to hold off a late push from the Western Force to claim their second win of the season. A 73rd minute try to Force's Tetra Faulkner saw the Force get within four points of the visitors, but the Rebels three converted penalties proved the difference in the end as they managed to withstand the final minute fightback. Rebels fly-half Jack Debreczeni was carried off with a leg injury in his team's 21-17 triumph after he slipped and twisted his right knee in the 54th minute when he attempted to change direction as he prepared to make a tackle. The 21-year-old was carried off by two trainers and struggled to walk when taken to the bench. Co-captain Scott Fuglistaller's first start of the year lasted just a tick over 20 minutes before he was forced off with what appeared to be a dislocated finger. The Rebels raced out to a 15-0 lead inside 33 minutes, but their advantage was whittled down to just four points when prop Tetera Faulkner crashed over in the 74th minute. The Force launched wave after wave of attack in the dying minutes, but they couldn't break through a resolute Rebels defence. The Force's fourth straight loss leaves them with a 1-4 record heading into tough games against the Bulls (Pretoria) and Sharks (Durban). The Rebels (2-2) face off against the Lions in Melbourne next Friday night. Force prop Pek Cowan left the field in the second half with either a shoulder or collarbone issue after copping a heavy hit from Rebels front rower Toby Smith while hovering over a ruck. In the corresponding fixture last year, the Force ran in four tries within the first 27 minutes to end the contest. But it was the Rebels who came out firing this time around, with fullback Mike Harris slicing his way through Pek Cowan and Kyle Godwin to touch down after just five minutes. A barnstorming run by Mitch Inman set up Dom Shipperley for the second try of the match and the Force were staring at a 15-0 deficit when Harris nailed a penalty in the 33rd minute. The Force struggled to launch many meaningful attacks in the opening half. But they pushed hard just before halftime and were rewarded when a quick penalty tap from scrum-half Alby Mathewson caught the Rebels' defence napping. At 15-7, the equation didn't look impossible for the Force. Heavy rain in the second half couldn't quell the Force's spirit, and a comeback looked to be well and truly on the cards when Faulkner barged over late. But it wasn't to be, with the Rebels surviving a nervy final few minutes to hold on for victory in front of a crowd of 9,972.